Zebra desktop printers integrate easily into a Quickbooks POS environment. Available in 2" and 4" wide models, direct thermal and thermal transfer, the Zebra desktop printers deliver optimal performance at an affordable price. Too many printer choices? 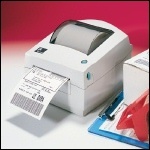 Call Barcode Warehouse for help in choosing the right printer for your application (888) 422-9249.